I attended several sessions of a club in Brooklyn Heights with a reputation for particularly active members. The treasurer, Bruce Schaffer, clapped so loudly that he sat in the last row of chairs in the room so he wouldn’t hurt people’s ears. He told me (after politely inquiring whether he should speak in “short, Hemingway sentences or long, flowery, Kerouac ones” for the interview) that being a Toastmaster for the past eleven years had changed his personality and improved his law practice. “I start my day feeling stronger and more powerful,” he said. In the morning when he wakes up, he sometimes yells as loudly as he can into a towel. We have used several costly consultants over the years for presentation skills training, media training, Q&A, combatting hecklers, etc. and here it is for free at Toastmasters. 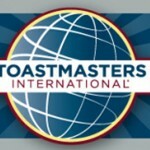 The pricey consultants laugh at Toastmasters – all the way to the bank. I run a speakers agency. Do you still bring in speakers/consultants/workshop leaders for your company? Alec, We run a highly sucessful international multilingual speakers bureau program and it would be nice to speak with you sometime. Alec, Thanks for your data I will contact you early next week – lets meet on Montague Street one afternoon.